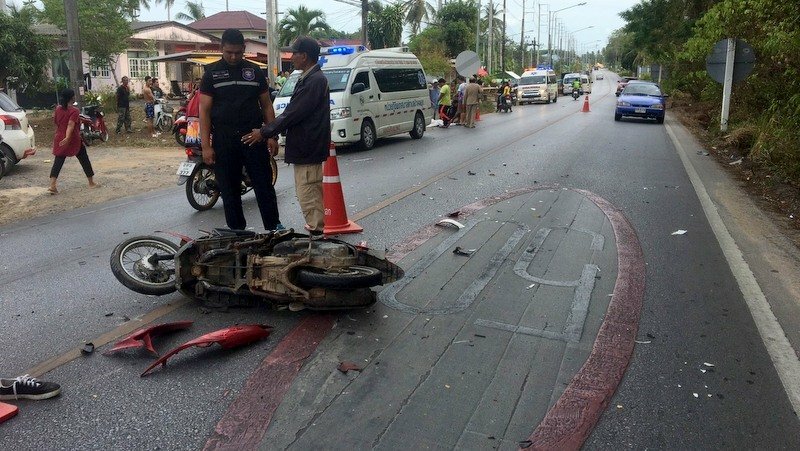 The number of deaths had climbed to three following the death of 20-year-old Koonwanee Hemmin in a fatal motorbike accident in Pa Khlok yesterday afternoon (Apr 15), the Phuket office of the Department of Disaster Prevention and Mitigation (DDPM-Phuket) reported this morning. Ms Koonwanee was overtaking a car when she was struck head-on by a passenger van travelling in the opposite direction near Baan Pa Khlok School on the road from the Heroines Monument towards Pa Khlok (Route 4027) at 4pm, the report noted. Ms Koonwanee died at the scene. Three other people were injured in three other accidents – one in each district: Muang, Kathu and Thalang – during the 24-hour period for Day 5 of Seven Days of Danger road-safety campaign, from midnight to midnight yesterday (Apr 15), the DDPM reported. • 74 fined for using mobile phones while driving. • 52 people were arrested for drunk driving during the period. Across Thailand, a total of 68 people were killed and 2,729 injured in 2,797 road accidents yesterday (Apr 15), according to the website for the national road-safety agency ThaiRSC. Bangkok recorded the highest toll with three dead 250 people injured during the 24-hour period, while Chiang Mai recorded two dead and 180 injured, the second-worst tally of the day throughout the country. Meanwhile, Nakhon Nayok remained the safest province in Thailand yesterday, with zero deaths and three people injured in road accidents. Yala was the second safest province on the roads with one dead, three injured during the 24-hour period. Another 785 without a driving license? With about average 800 a day, x 7 days= about 5600 without driving license. Not yet talking about all those who not have a driving license but are not checked this week! No wonder Phuket roads are very dangerous with thousands of thai without driving license. Foreign tourists have driving license as rental companies already checked that. Right?